RIP, Devil Dance. 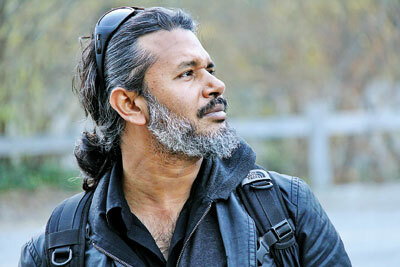 This week, in our Q&A with author Shehan Karunatilaka we take a moment to grieve for the much-anticipated manuscript that earned him a place on the shortlist for the 2016 Gratiaen, and gain some consolation in word of two new books, ‘Chats with the Dead’ and a children’s book and the possibility Chinaman might live again as a mini-series for television. I think a lot of parents are going to relate right away to your book for children, ‘Please Don’t Put That in Your Mouth’. How much of it is autobiographical? I have a daughter and a son, both under 5, and it’s fascinating how differently they are wired. And how looking after them can be equally stressful, but in very different ways. My daughter is constantly in your face, asking questions, demanding attention and singing that awful Elsa song. My son, by contrast, will amuse himself quietly in a corner. But he’s the one you need to watch closely. Because he’ll be the demon climbing furniture, pulling wires out of sockets, throwing rocks at windows, and yes, putting all sorts of things in his mouth. I laughed out loud at these illustrations. Could you talk about the collaboration with Lalith Karunatilaka? What made this a project you wanted to partner on? Malli is a very talented artist and designer. We worked together on a collection of short stories, which he illustrated. While the pictures were brilliant, the stories were not, so that project got shelved, but hopefully it will resurface, if only to showcase his artful drawings. After years of reading to the kids, I realised that it’s easier to write A Very Hungry Caterpillar than say, an Infinite Jest. And that the former outsells the latter by a gazillion copies each year. So I took a break from writing novels aimed at discerning readers, to try my hand at books aimed at drooling toddlers. While I found that they weren’t that much easier to write, at least they didn’t consume as much time. Devil Dance, your last manuscript, was shortlisted for the 2016 Gratiaen but never published. Is it still a work in progress? When might we see it in print? Some stories just stop breathing and no amount of CPR or adrenalin shots or author’s tears can resurrect them. Much like my first book, The Painter, I think I tried to cram too many ideas and plots and characters into Devil Dance and it ended up choking on its own pages. I tried for months to resuscitate it, but I couldn’t seem to find a pulse. So then I grieved for a few months and moved on. I now use it as scrap paper for my kids to scribble on, so it’s not a complete waste. What else to do? There’s also been this exciting news that Chinaman has been optioned for film! Do you know whether you will be involved in the production or not? Yes, very exciting. I’ve been toiling for years with no joy and then this year, I suddenly have two finished books and a TV show! It’s been optioned by a famous production company for an international streaming platform. I’m guessing it’ll be a mini-series, but then again, they milked three seasons from The Handmaid’s Tale, so who knows what miracles these TV folk can do? The offer came over Christmas and the deal was finalised a few weeks ago, thanks to the sage advice of my dear friend Aftab Aziz and my tireless agents Sidharth Jain and Kanishka Gupta. While it is thrilling, I doubt I’ll have anything to do with the final product, which is probably for the best. They say it’s like operating on your own children, which I’ve tried once, not very successfully. That said, I have plenty of ideas on how it could be filmed, so if the writers get stuck, they know who to call. I did ask for the role of Pradeep Mathew, cos I can still bowl a decent Chinaman and a passable double bounce ball, but their lawyers came back with a polite no. Of course these things can famously take ages, so by the time it gets made, I may even be old enough to play WG. Chinaman was published to such critical acclaim in 2008, and really established you as one of Sri Lanka’s most exciting literary voices. In retrospect, what kind of pressure did that place on you? As a writer, how do you balance your readers’ expectations with your own need to ensure the book is ready, and something you’re happy to release? It’s been nine years since I finished Chinaman. And it’s been an action-packed nine years. I moved country twice, quit two jobs, got married, had two kids, shaved my head, grew my hair again, got some tattoos, lowered my cholesterol, wrote two unpublishable novels and a collection of unreadable stories. It’s only over the last two years that I figured out what I needed to do. Which is shut up and forget about Chinaman and readers and expectations and pressure, and silence all the noises in my head, and find a new story to tell. After nine years, I’ve finally written two things that don’t make me cringe. And that has to be something worth celebrating. Tell us about Chats with the Dead. Does it embrace some of the themes of Devil Dance? Do you have a publisher lined up? Chats with the Dead is me learning from the mistakes of Devil Dance. It’s a much simpler book, with better realised characters, an authentic tone, and a more focused plot. It’s hard for me to describe it, because I’m not sure what it is, other than a comedy about mass graves. Or something. It’s set in Sri Lanka’s past and features a cast of dead people and lots of apocalyptic jokes. It’s heavily influenced by Cormac McCarthy’s Blood Meridian, Kurt Vonnegut’s Galapagos and George Saunders’ Lincoln in the Bardo. Or so I hope. I’ve spent three years on it and it doesn’t make me cringe, and, like I said, that is something worth celebrating. And yes, there are several people crazy enough to have expressed an interest in publishing it. So despite its title, it won’t be joining Devil Dance or The Painter in my graveyard of dead books. For you as a writer, what does a nod from the Gratiaen represent? What role do you think the prize has played in nurturing Sri Lankan writers? The Gratiaen has the best deadline out of all the prizes. Better than the Grammys, the Oscars or the Nobel prize. And I’m sure I’m not the only one who feels that way. You just need to walk into any Sri Lankan bookshop to see how the prize has changed the landscape of local writing in English. For me, Lankan literature divides into pre-Jam Fruit Tree and post-Carl Muller. I owe much of my writing career to it. If that sounds like I’m sucking up to the Gratiaen Trust, it’s because I blatantly am. I hope it works.